As summer comes to an end, I want to post an update on our garden. Overall, I am thrilled with this year's crops! I feel like last summer was a total bust, so I'm glad we had better success this year. I'll start with our biggest success: watermelon. This is only our second year growing melons, and last year, we yielded two watermelons. This year we have already picked 4 melons and hope to have two more! Strangely enough, I'm not sick of watermelon. My kids have thoroughly enjoyed eating slice after slice, but I've also made watermelon sorbet (delicious) and a watermelon juice drink with mint and jalapeno (equally delicious). I can say with assurance we will be trying our hand at watermelons again next year. I wasn't sure how my tomatoes would do out of the gate. My little seedlings were slow to start, but they really finished strong. I've made Roasted Tomato-Chipotle Salsa a couple times, and I hope to make my first batch of pizza sauce soon. Stay tuned! Our pepper plants have almost been a complete bust. We have two jalapeno plants that managed to survive, but our bell pepper plants totally flopped. I've never had issue with growing peppers before, so I was a bit surprised. I don't think my seedlings were strong enough when I planted them outside. I plan on making some jalapeno poppers sometime this week with the few hot peppers that managed to survive. This is the third or fourth year in a row we've tried growing squash of any kind, and again, it's been a failure. This year, we grew pumpkins. The plants started out strong and then all-of-a-sudden started dying on us. We had a few gourds growing, but they've since shriveled up and died. So sad; my son is a bit devastated. I'm sure some type of bug got to the plant, and I don't think we have the best soil to grow squash. We haven't harvested our sweet potatoes yet; we'll probably do that in the next couple weeks. We also had really good success with green beans this year! Next week, I'll show you how freeze green beans to enjoy throughout the year. Stay tuned! Have you ever had success in growing pumpkins? 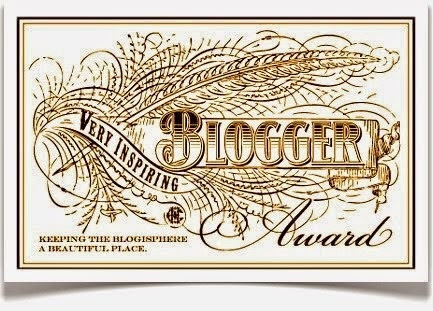 A few weeks ago, a new blogging friend nominated me for the "Very Inspiring Blogger Award". Thanks, Elle, for thinking of me! I first "met" Elle during the A-to-Z Blogging Challenge. She has a wonderful blog, Erratic Project Junkie, and if you like DIY projects you definitely have to check out her blog. It's great! I love cheese. As my wise uncle once said, "food is simply a vessel in which cheese is to be carried." Although I am a stay-at-home mom, this is not my natural gift set. I enjoy the domestic arts and love my children dearly, but I struggle with my "nurturing, motherly" side. I quit my career because the Lord very clearly called me to stay home, so I'm simply obeying His call. Don't get me wrong...I do enjoy it; it's just a really difficult role for me. I like dark, rich beers. Give me a stout or a porter over a pale ale or wheat beer. I don't like banana flavored things. I like bananas, just not things flavored like bananas. I don't drink coffee. Yes, I am probably one of 0.0001% of the population that falls into this category, but it's true. I do, however, enjoy hot tea. English breakfast with milk, please! My current dream for my family would be to get a small trailer and travel the country for a couple months hitting as many U.S. National Parks as possible. This dream began as a young girl when my family took a cross-country trip to Yellowstone National Park and the Grand Tetons. I've never been to Glacier National Park, and I'd love to go. Take seeds from some of the first fruit you pick from your plants and let them dry out on a paper towel. You can use seeds from fruit picked later in the season, but I've been instructed (by a successful tomato growing friend) that it's best to use seeds from fruit early in the season. Apparently you'll have better success with your plants. Then, simply wrap those seeds in a dry sheet of paper towel, seal them in a plastic baggie, and label the baggie. Keep them in a cool, dry place until you're ready to plant next year. If you want to plant multiple varieties of tomato plants, be sure to keep seeds from each type of tomato plan you'd like to grow. Just be sure to keep those seeds separate by variety so you can easily identify them. Before you know it, February will be here, and it'll be time to begin this crazy process all over again! I've been a little delinquent in providing updates on my tomatoes. Over the last week or two, my tomatoes started turning red, and I was able to pick my first fruit! What a glorious day that was. I prepared over six months for this day since The Beginning, and I certainly enjoyed every bite. I made a grilled cheese and tomato sandwich with it. My tomatoes have not gone unscathed though. Birds started pecking away at my beautifully ripening fruit! Buggers. If it continues, I may lay some netting over my plants. Stay tuned for my next tomato post where I will explain how you can save your seeds from this year for next year.